Punch out of the hole with the 90hp Yamaha four-stroke was impressive, as was cornering ability without cavitation. Deck layout is logical, spacious and customisable, with four seating positions for passengers. Optional kill tank of a good size. Carpeted ‘padding’ minimises noise under way. Very deep casting deck happily swallows 80-litre Eskies. 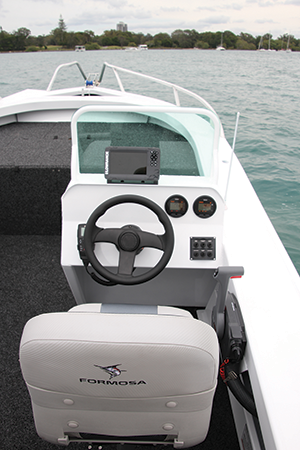 Seat nudged forward due to Active Transom but once seated, controls fall easily to hand and 660mm-wide console provides some protection. Chunky beam carries a long way forward, giving the 520 Side Console a ‘blunt’ profile and affording excellent interior space. Sea-Rod’s water ballast chambers doing their thing and providing exceptional stability at rest. 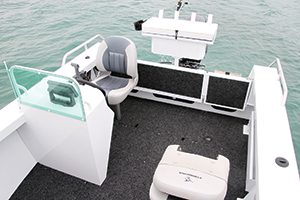 FORMOSA Marine is certainly one of the more innovative boat-building brands operating today. 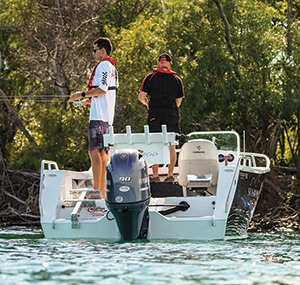 In the 20 years since its inception, the business has gone from strength to strength and the Formosa range has continually expanded, including adding the Sea-Rod sub-brand to its portfolio in 2011, with a plethora of innovations along the way. I recently found myself on the Tweed River checking out several Formosa Sea-Rod models. One of the boats that really piqued my interest was the Sea-Rod Classic 520 Side Console powered by a 90hp Yamaha four-stroke and sporting the brand’s unique ‘Active Transom’. I’ve discussed the Active Transom in more detail in another post, but it essentially utilises self-supporting folding transom doors for unparalleled access between the deck and water. Formosa boats have always appeared ‘big’ for their size, and this V2 Plate Hull example was no exception. Measuring 5.4m from bow roller to stern, possessing a substantial beam of 2.4m as well as serious depth in its 4mm-thick side sheets, the Sea-Rod 520 Side Console certainly makes its presence felt. This becomes immediately apparent on the water too, with the sheer interior volume of what many would deem a ‘bay’ boat making it feel impervious to waves and ready to hit the high seas at the drop of a hat. However, it’s here I should reiterate I was testing the ‘Classic’ version of the model. 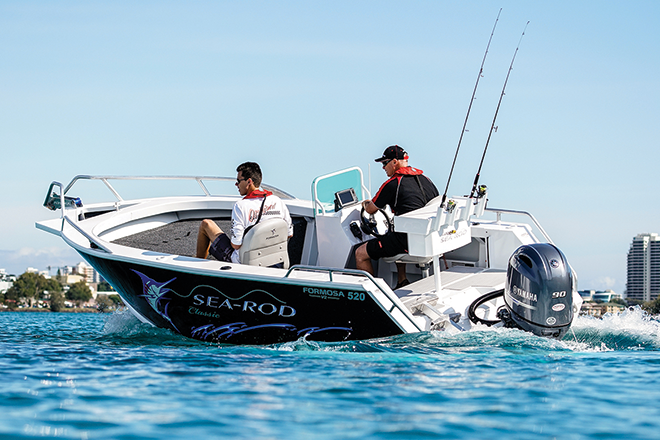 Sea-Rods are offered in two versions in most sizes, either Classic or Offshore, and as the name depicts, it’s the Offshore models that are better suited to heading through coastal bars and tackling the deep blue thanks to features including a self-draining aluminium deck. The Classic version as tested and photographed here makes do with a marine-grade ply floor covered in typically hard-wearing marine carpet. Something that quickly became clear while using the 520 Side Console as a photo boat was its exceptional stability both under way and at rest. Sea-Rod’s unique four-chamber counterbalance water ballast system is to thank for the level playing field at rest, while under way the chambers rapidly empty and pass the baton to a properly sorted hull design that nails the smooth and dry brief. In fact, I can happily report that in my time spent aboard the Sea-Rod 520 Side Console, barely a drop of spray made it over the gunwales, despite some ‘enthusiastic’ driving and playing up for photographs. 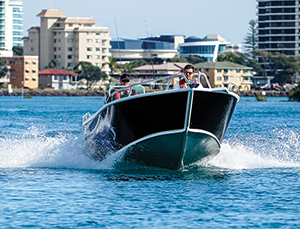 Seated behind the 660mm-wide side console, I certainly didn’t cop any salt water to the face or hands, even when cracking along at wide-open throttle into and across a sharp Tweed River chop. Speaking of throttle, when wound right out with two people on board and powered by an extremely fresh 90hp Yammie (just one hour on the clock! ), the 520 Side Console nudged 57km/h at 5700rpm, which I found impressive considering this rig is rated to a whopping 140hp. Yes you read that correctly, 140hp on a relatively lithe (650kg dry) open boat. Wow, I would absolutely love to take one of these for a spin with Yamaha’s awesome 130hp four-stroke on the back. It would certainly make for a power-packed combo. As it was, both Jeff (Boatsales) and I were really impressed with the rolling punch this setup displayed and were actually surprised the top speed wasn’t higher – it felt quick. The way it launched from a happy cruise at 4000rpm and 38km/h out towards that top speed was genuinely impressive and I don’t think many owners will find a 90hp outboard lacking on their 520, unless really loaded with gear and people. We know from previous testing that Yamaha’s 90hp four-stroke also delivers incredible fuel economy, so the savings at the bowser will definitely be appreciated by those who opt for the smaller motor. Range anxiety isn’t something likely to be encountered too often, however, with the 520 Side Console fitted standard with a capacious 115-litre underfloor fuel tank. 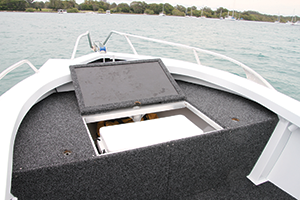 Equally accommodating on this boat is storage, and on the test day I was pleased by the number of options available around the deck, with rear side pockets, a kill tank and two massive storage hatches in the casting deck. 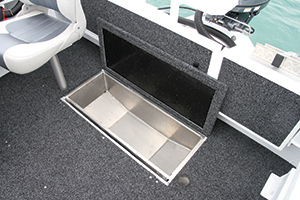 Of note was the flat floor under the casting deck, which enabled the larger bow hatch to swallow an 80-litre Esky and allowed it to sit level and out of the way, freeing up maximum deck space for fishing endeavours and moving around the boat. 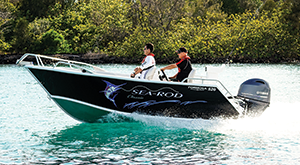 In summary, with safe and predictable handling, a soft and dry ride, excellent stability at rest and a uniquely versatile transom area, it’s easy to recommend the Sea-Rod 520 Side Console. It makes perfect sense as an affordable and bulletproof (4mm alloy all round) bay and estuary boat, yet won’t disappoint those who like to duck offshore either. The test rig was supplied by Gold Coast Boating Centre, so jump on goldcoastboatingcentre.com.au or call 07 5576 7388 to organise a test drive of a Yamaha-powered Formosa today.